There are a lot of sound reasons why one might shave their head. It’s no secret that hair, even of the short variety is a lot of expensive and time-consuming maintenance. The problem is it can be difficult to figure out how to shave your head with a razor. While most men are familiar with shaving their faces, shaving your head is obviously a different animal. The process can seem daunting, especially for those with longer hair. In reality, while it takes some patience, it’s really not so difficult if you take it step by step. That said, let’s take a look at how to shave your head with a razor one step at a time. 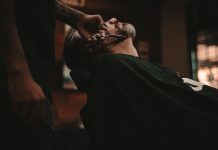 If you already have very short hair of the buzz cut variety, you might be able to step, but it doesn’t hurt to go ahead and do this regardless. Regardless the type of hair you have, be it thin or thick, soft or wiry, you’re going to want it to be as cooperative as possible. 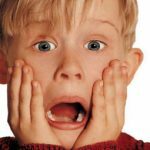 You’ll also want to prepare your scalp for the irritation of shaving and the exposure it will endure once the hair is gone. 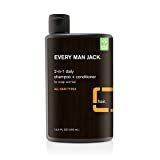 First, vigorously shampoo your hair using about half again the amount of shampoo you normally would. Anti-dandruff shampoo (even if you don’t suffer this condition) is recommended. Be sure to stand outside the shower stream while you massage the shampoo deeply into the roots and onto the scalp. Do this for no less than three (3) minutes. Rinse the shampoo out of your hair with the hottest water you can tolerate. Run a comb through your hair in the most abrasive manner you can, removing tangles and further stimulating the scalp. Next, work in an equal amount of conditioner into your hair, spending another three (3) minutes massaging it into the roots and scalp. Once more, rinse in very hot water, running the comb through your hair as you do. Don’t rinse all of the conditioner out – you’ll want a very slight oily sheen to remain, which makes your hair more cooperative for the next steps. Blow dry your hair (avoid towel drying if possible), combing it back repeatedly as you do. Stop when the hair is damp but not drenched. Once your hair’s damp but not wet, it should have a limp, slightly oily texture with a shine to it. Comb it back, parting it down the middle if at all. 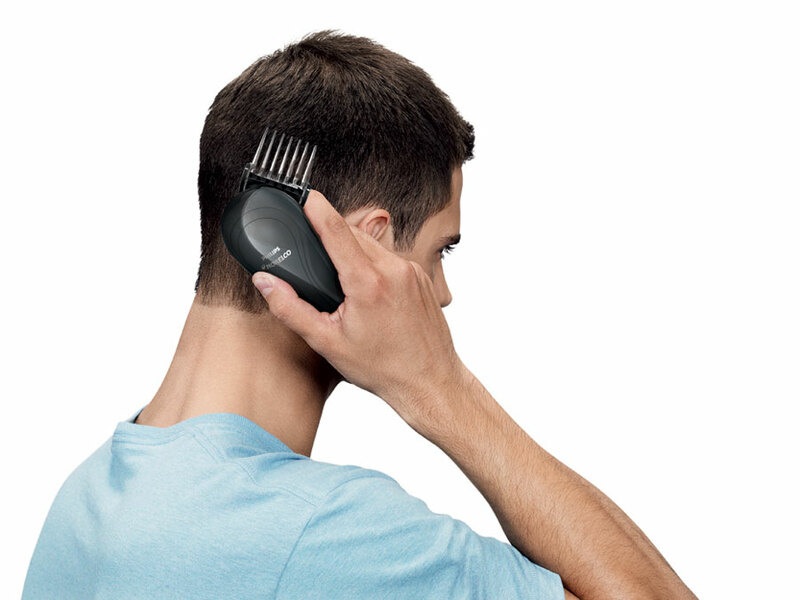 Using a pair of sharp scissors, begin running the comb through the hair; cut it as close to the comb as possible. Cut repeatedly from front to back as evenly as possible. Don’t worry if you don’t know how to properly cut hair of course. Once it’s as short and as more or less even as possible, you’re ready for the final trimming stage! You might want to rinse your hair and blow dry it once more before proceeding to this step, but it’s certainly not required. Using clippers with a #1 guard, begin slowly trimming your hair from front to back once more. Do this very slowly, and in rows as though you were mowing a lawn. Be sure to take your time, or the clippers can “bite”, a painful pulling of hair. Depending on the clippers and your hair type, this may take between four to six passes to get it evenly short. Be sure to rinse the clippers and guard at least twice during this process. This will keep them cutting properly and prevent damage to the tool. At the end of the process, you should have a military-styled buzz cut with the hair being 1/8 of an inch or shorter in length. 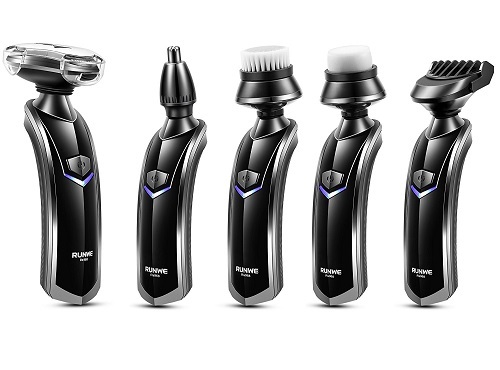 You may want to rinse your hair once more, as it’ll make the actual shaving easier. At this point, it no longer matters if you use a towel or blow dryer to do so. We’re now past the most time consuming and difficult part of how to shave your head with a razor. 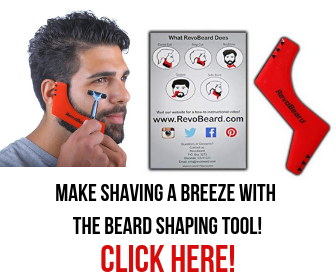 The actual shaving is relatively straightforward. 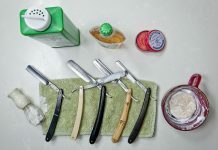 Any new razor will work for this process, but a two or three-blade razor of decent quality is recommended. 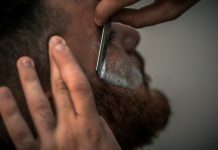 It’s tempting to simply wet your hair at this point and “dry shave” first. For the sake of your scalp, don’t do this! 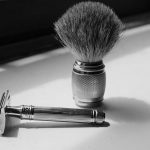 Any shave cream will work just fine but avoid the mentholated kind for now. 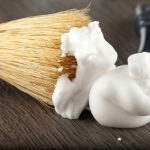 Thoroughly coat the entirety of your hair in shave cream as though you were shampooing, but don’t massage it in – it’ll lose its fluff if you do. Very slowly begin shaving against the grain of your hair, from front to back starting from the middle. 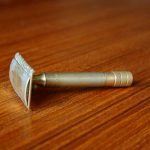 Each stroke of the razor should only be one (1) or two (2) inches long. Repeat this until the front half of your head is completely shaved. For the back, it will be easier if you can have a second adjustable styling mirror to let you see what you’re doing. If you don’t have one, you’ll have to use your sense of touch to guide you. Again, slowly shave along the contour of the base of your skull in couple-inch stroked until you reach the base of your skull. For the nape of your neck, tilt your head forward so your neck is as straight and level a surface as possible, repeating the gentle, short strokes. Upon completion, you should be pretty much bald. Rinse your scalp in warm (not hot!) water and gently towel-dry. 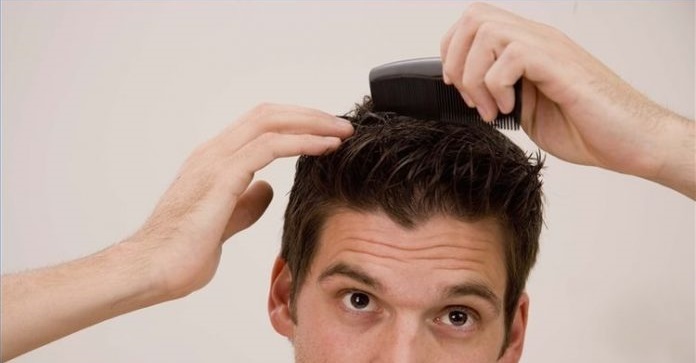 Allow your scalp to dry for ten to twenty minutes and then inspect it visually and with your hands. 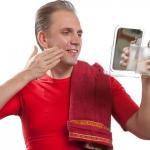 You’re likely to find tiny patches of possibly invisible, bristly hair. Simply apply some shave cream and gently shave these spots once more, very gently. Initially, your scalp may show blotches and skin blemishes. With proper care, these will vanish quickly enough. 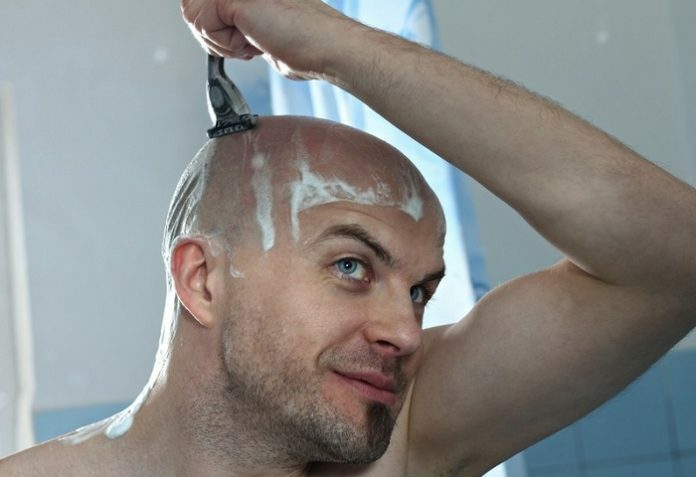 Something people sometimes forget when it comes to how to shave your head with a razor is the scalp care needed. When people naturally and gradually go bald, the scalp has ample time to adapt to exposure to weather and the sun. 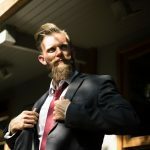 When shaving your head, this exposure is very abrupt, meaning your skin isn’t used to the sudden loss of protection by your now long-gone hair. 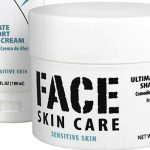 To remedy the razor-burn and prevent further irritation, apply gentle lotion (preferably with aloe) to your scalp immediately, and remain indoors until it’s properly absorbed. For the first few weeks, you’ll want to do this every time you shave. If you’re not going to wear a hat, be sure to apply a gentle, odorless sun screen to your scalp regardless the weather and time of year. In daylight (even during a rain or snow storm), you’re still being bathed in UV light. Most of your skin is toughened against this weaker UV, but your scalp is certainly not! This entire process may take an hour or so the first time. 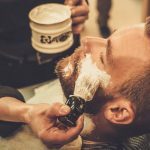 However, daily shaving should only take a few minutes once your scalp is toughened against razor irritation. Once your skin is used to this treatment, it’ll become just as routine as shaving your face. 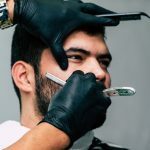 Enjoy the severely reduced daily maintenance and expense of hair care products you’ve earned by taking your time and following the steps for how to shave your head with a razor the right way!